This Father's Day, learn how fitness can make you an even better parent. Then, make sure you get breakfast in bed! Becoming a dad is a life-changing experience. Suddenly, you're responsible for another human being who needs a lot of your time and forces you to take on a whole new set of responsibilities. It's easy to think your personal health and wellbeing have to take a back seat to your child's. But you can be fit and be a great dad. In fact, I think it's my duty to do just that! As a father and a fitness professional, I see every day how my fit lifestyle has a positive impact on my daughter, and I want you to see it in your own life, too. 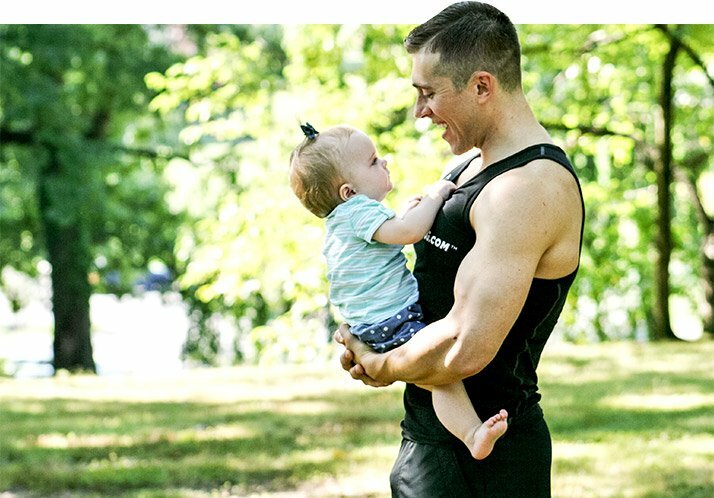 Here are my four favorite ways fitness makes you a better father! Each minute of each day that I get to spend with my daughter is a treasure, but minutes and days aren't enough for me. I want to be around as long as possible! I want to watch my daughter grow and enjoy the wonders of life for years, decades, and generations to come. I'm sure all you dads out there feel the same. I know making time for exercise can be difficult. You're busy—we all are. But too busy? I don't buy it. I'm pretty sure there's some wasted time in your week right now that's perfect for exercise. Even small sessions spread throughout the day or week will add years to your life—years that you get to spend with your family down the road. To live a long, healthy, happy life, you need to eat well, sleep plenty, and laugh often. Honestly, I'd be devastated if I only got to watch my daughter make the most of her childhood. I want to be able to share in the experience! Not only can regular exercise increase the length of your life, it also gives you the energy and ability to match your kids jump for jump and roll for roll. Why should they get to have all the fun? By training your muscles and energy systems to make you more athletic and capable, you don't have to be the dad who sits on a bench dinking around on your phone while your kids enjoy playing in the park. You get to play with them! Playing with your children strengthens your relationship with them in ways that are hard to explain. You just have to experience it—but trust me, it's just as much fun as it looks! My favorite way to play is running through the sprinkler with my daughter, but that's just one of countless things we do. Running, jumping, pretending to be animals—it's all great active play, and as an added bonus, it wears kids out and gets them ready to sleep as hard as they play. That's a win-win if I ever heard one. News flash: The world isn't going to teach your kid how to eat right. In fact, the exact opposite is true. On TV, at school, and pretty much everywhere else, kids are being taught that sugar and prepared foods are the only fun things to eat, and everything else is punishment. You already know it's your duty as a parent to get healthy food into your kids by one method or another. Here's one that not nearly enough people try: letting the kids get in on the preparation! Show them that fit dads cook, and cook well. Cooking is a practical, invaluable skill, but it's also something that's really fun for kids to do. They've been watching you do it—why not let them join in and take some ownership of mealtime? Cook with your kids whenever possible, and show them how fun it can be. Kids love treats, of course, so make some time to teach them how to make treats with a healthy spin. There are tons of great recipes available that are fun to make, taste amazing, and are part of a healthy diet. And let's not forget that you probably need the occasional treat, too. Kids are smarter than we give them credit for. We think we're fooling them by saying one thing and doing another, but trust me: We're not. As they grow up, they see the way we live and absorb our best and worst qualities. If you come home every day exhausted, eat like garbage, and watch TV until way past bedtime, that's the message you send them about how to live life. You may think you can pick and choose what they learn from you, but sorry—you can't. So you only choice is to embrace the challenge of being a better example in all ways: mentally, emotionally, interpersonally, and physically! How you treat your body will rub off on your kids, so choose your words and actions wisely. Say positive things about fitness, being strong, and loving your body and your active lifestyle. Tell your kids you like working out, playing hard, and eating healthy. Show them how being fit allows you to maintain tireless energy and positivity. Sure, you can try to push them into fitness, but a better way is just to live it and love it, so they see the rewards in action day in and day out. Knowing your kids look up to you, admire you, and use you as a standard for behavior should be all the motivation you need to be a positive, strong role model. Teach your kids how valuable and truly remarkable the human body is, and be the superhero they think you are. Hoyert, D. L., Kung, H. C., & Smith, B. L. (2005). Deaths: preliminary data for 2003. National Vital Statistics Reports, 53(15), 1-48. Dallas, C., Gerbi, A., Elbez, Y., Caillard, P., Zamaria, N., & Cloarec, M. (2014). Clinical Study to Assess the Efficacy and Safety of a Citrus Polyphenolic Extract of Red Orange, Grapefruit, and Orange (Sinetrol?XPur) on Weight Management and Metabolic Parameters in Healthy Overweight Individuals. Phytotherapy Research, 28(2), 212-218. Blair, S. N., Kohl, H. W., Paffenbarger, R. S., Clark, D. G., Cooper, K. H., & Gibbons, L. W. (1989). Physical fitness and all-cause mortality: a prospective study of healthy men and women. JAMA, 262(17), 2395-2401. Lee, D. C., Sui, X., Ortega, F. B., Kim, Y. S., Church, T. S., Winett, R. A., ... & Blair, S. N. (2010). Comparisons of leisure-time physical activity and cardiorespiratory fitness as predictors of all-cause mortality in men and women. British Journal of Sports Medicine, 45(6), 504-510. Wei, M., Kampert, J. B., Barlow, C. E., Nichaman, M. Z., Gibbons, L. W., Paffenbarger Jr, R. S., & Blair, S. N. (1999). Relationship between low cardiorespiratory fitness and mortality in normal-weight, overweight, and obese men. JAMA, 282(16), 1547-1553.